High turnover and low engagement and productivity are the end result of deeper issues impacting your organization. When people don’t feel they can grow, aren’t getting clear direction from their managers, don't feel supported by their team or the workplace culture they will quickly become disillusioned and begin to look for new, more challenging opportunities. The first step is to identify what these underlying issues are and create a talent management strategy to address them. Check out these 15 questions to ask in your next engagement survey to find out. The problem is... even if your HR team knows introducing a new performance management system is necessary, the organizational-wide changes it can introduce require executive buy-in to fully get them off the ground. Let's say you're Aviato, a Silicon Valley based tech company of 300 people who make an average salary of $60,000. Everything seems to be going well until you get your people analytics report and find out you're experiencing a 25% annual attrition rate! To make matters worse, out of the people who have stayed, 17.2% are disengaged. This has had a major impact on productivity and morale. You know that a new ping pong table won't improve the situation, so you send out an engagement survey and find that what people are really missing are more opportunities to grow and development. So you decide to introduce a new performance management system which will help you move from annual to quarterly performance reviews. Additionally, you decide to introduce a real-time feedback app to encourage people to ask for feedback when they need it and increase the overall rate of feedback being exchanged in between reviews. High turnover is a company’s worst nightmare. SHRM claimed that it costs companies 6-9 months of an employee’s salary to replace them (when considering an employee who makes $60,000 this can mean $30,000-$45,000 in recruitment and training costs alone!). A study, the Center for American Progress reported the average cost of replacing an employee to be 21% of their average salary. Another estimate cited by Josh Bersin from Bersin by Deloitte put it at 1.5-2X an employee’s annual salary. Whatever the cost, turnover can have a major impact on your company’s financials, not to mention the impact it can have on morale and simply getting things done. If your main objective with your new performance management system is to decrease turnover, consider setting a retention goal. At the end of your first year using this new system, what should your retention rate look like and what will you save by achieving this goal? Once you have this number, set a conservative goal based on industry benchmarks. Gallup found that simply by giving more continuous strengths based feedback companies can reduce turnover by 14.9%. While engagement may seem like the most people focused HR metric, there is a clear link between engagement and bottom line objectives. 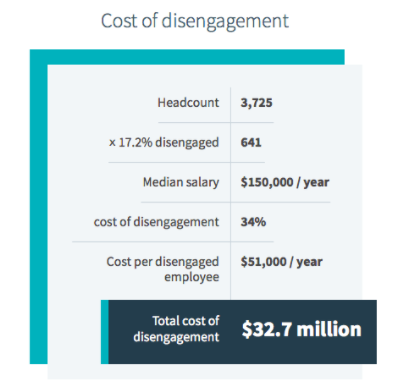 Gallup found disengagement costs $3,400 for every $10,000 of salary. On average approx 17.2% of the US workforce is actively disengaged. 98% of employees fail to be engaged when managers give little or no feedback. However, the good news is, studies show that 43% of highly engaged employees receive feedback at least once a week. A study by Western Michigan University found that great feedback can increase performance by 5%-20%. Additionally, Gallup found that teams with managers who receive strengths feedback experience 12.5% greater productivity post-intervention than teams with managers who receive no feedback. Take a conservative approach by calculating how much more your company could gain from employee productivity if performance is increased by the minimum 5%. Setting long term goals will provide you with a way to measure the effectiveness of your new system after a year of using it. However, it’s essential that you also set short term goals/milestones that you can use to make sure you’re on track and working towards this end goal. Check out this article with ideas for setting short term goals to keep you on track. The Impraise Customer Success team helps you set up your performance management system but also to measure success. Schedule a call here to learn more.